?Gage de Mon Amitié? Lépine à Paris, No. 857, circa 1765. Very fine and rare 20K gold-mounted agate pair-cased watch with contemporary châtelaine, scent compartment, and unusual seal and key. C. Outer: two-body, made of gold-mounted striated agate. Inner: two-body, Louis XV, polished. 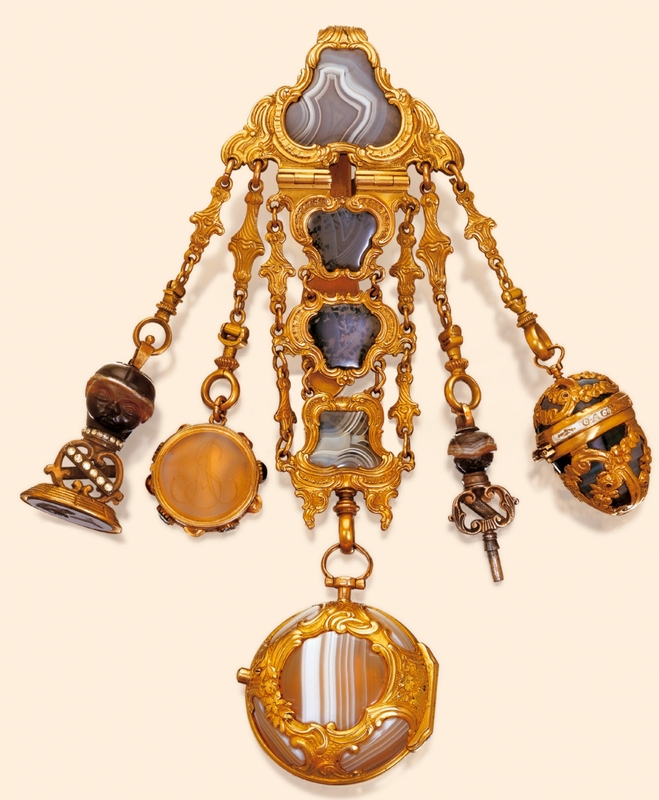 Châtelaine: of four links in gold-mounted gray striated agate, gilt brass spoon, four chains for seal and key with blackamoor handles, tambourine charm, and striated agate scent compartment with white enamel edge and the words GAGE DE MON AMITIE (slightly chipped). D. White enamel, radial Roman numerals, outer minute dot divisions with five-minute Arabic markers, winding aperture at 2 oclock. Gold Louis XV hands.